Barrel aging at home is fairly simple, not ridiculously expensive and seriously worth doing. The in’s and out’s of getting started are covered in our Barrel Aged Cocktails page. While simply barrel aging cocktails is reason enough to get started, the real magic occurs when you age something in a barrel previously used for a different cocktail or spirit. For instance, tequila aged in a barrel previously used to age sherry, bourbon, Manhattans and gin. Or White Whiskey aged, first in a new charred barrel, then aged further after Negroni’s and a Martini. Each of these take on flavors far beyond those found in a charred barrel alone. Thus, the fun! Here are some examples of what we’ve been putting in our barrels. Add the cherries, (or place them on a pick), and express the orange peel over the drink and discard. This is one of my favorites. The Sherry Cask Aged Bourbon alone makes barrel aging at home worth while! I used Russel’s 10 yr Old Bourbon. For an aged bourbon, Russel’s has a lot of spice. 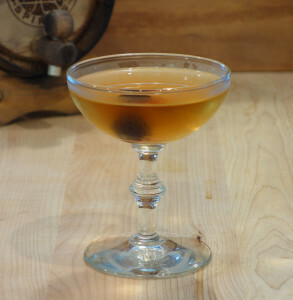 Aging in a Sherry Cask which had previously been used to age Manhattans mellowed the spice. 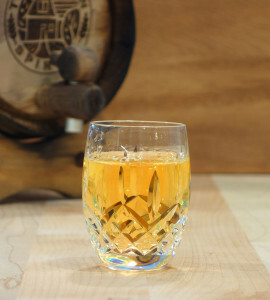 There are significant flavors from the charred oak barrel: oak, clove, vanilla, and caramel. You can also taste the sherry along with dried fruit, possibly from the Manhattans. 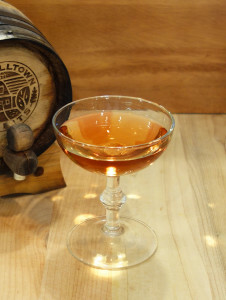 This cocktail is similar in concept to a barrel aged Manhattan cocktail. However, since the bourbon has taken on flavors from the Sherry barrel while the vermouth was not exposed to the barrel or allowed to oxidize, the flavor is significantly different. As noted above, the Sherry Cask Aged Bourbon brings flavors from the charred oak barrel: oak, clove, vanilla, and caramel with a touch of aged Sherry. The unaged Carpano Antica maintains its rich flavors of fruit and almonds with spice and a slight bitterness on the finish. Together, they create a fabulous cocktail. Chill a cocktail glass with ice and water. Stir to combine all ingredients, sans cherries, in a mixing glass with ice. I used Milagro Plata Tequila and aged it for 2 weeks. The barrel was the one described above with Hudson’s White Whiskey alternating with Negroni and a one time Gin Martini. With this aging, I had placed the aged White Whiskey in the barrel just prior to the Tequila. I suspect that the flavor profile might be significantly different if the Tequila had followed a Negroni instead. In the 2 week time, the Tequila took on a little color and a lot of flavor. I was aiming for a primary Tequila flavor with background barrel notes. I was not trying to create Repasado from Plata. After the 2 weeks, the flavor of charred oak was fairly prominent but it was still Tequila and it had picked up vanilla and clove from the oak and spice from the whiskey/Negroni. There was also some dried fruit and herbs from the Negroni. After a few weeks in the bottle, the charred oak flavor diminished some while the rest of the flavors remained. 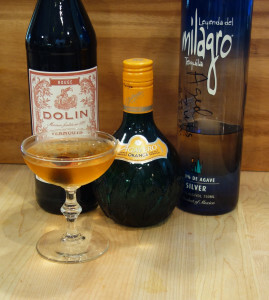 In our standard Tequila Manhattan, I use Lillet Rouge instead of vermouth. This cocktail calls for a much lighter touch so Dolin Sweet Vermouth fits nicely. 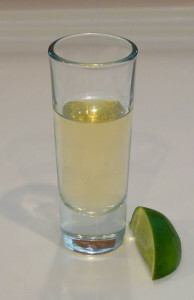 Sticking with the Tequila theme, I used Agavero Orange Liqueur as the sweetener. It has a nice orange flavor and is a little sweeter than Grand Marnier. 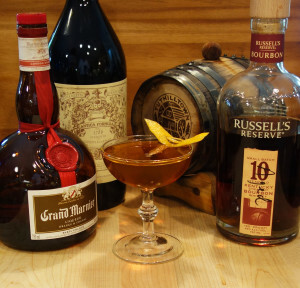 If you need to substitute, use more Grand Marnier or add a dash of simple syrup. I wanted to keep the “Manhattan” flavors as much as possible so I went with Bitter Truth’s Jerry Thomas Own Decanter Bitters. The maraschino cherry brings the last touch of sweetness while the bitters up the complexity. 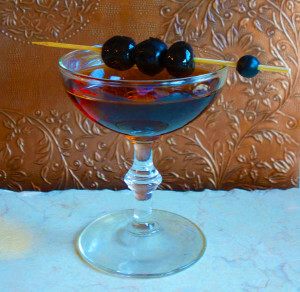 Strain into chilled cocktail glass and garnish with the cherry. The most distinctive thing about gin is the fresh, herbal flavor. This is true whether you prefer a heavy juniper London Dry or one of the New American Styles. In my use, barrel aging any gin cocktail flattens those herbal notes. They are still there, but the bright, fresh aspect is gone. What is added by the barrel aging process depends almost entirely on what was previously in the barrel and how long the gin is aged. 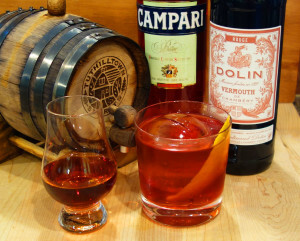 The process works very well for a Negroni – not so much for any type of Martini. 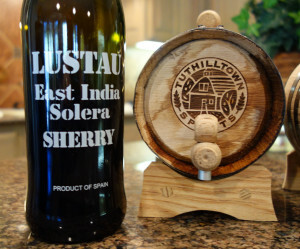 I have seen Sherry Aged Gin on the market, so I wanted to try this with my Sherry barrel. I chose Ford’s Gin, one of my favorite London Dry’s. 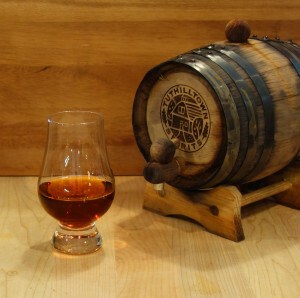 The barrel had been used to age Sherry, several Manhattans, including a Tequila Manhattan and bourbon. The Sherry went back into the barrel between each Manhattan and before and after the bourbon. So, it had last been used for Sherry just prior to the Gin. Of note, this barrel was reaching the end of its life. Ultimately, you extract all of the flavors – just like a tea bag. After the Gin, I put the Sherry back in the barrel for 4 weeks, then followed it with Bourbon. 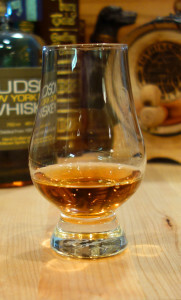 The Bourbon required 8-10 weeks to achieve the flavors that previously had taken only 4 weeks. After that, the barrel was done! The Gin was aged for 4 weeks. What came out was straw colored. As noted earlier, the Gin looses some of the brightness of the botanicals but gains a touch of charred oak, a bit of bitterness, clove, cinnamon, dried fruit herbs from the vermouth in the Manhattans along with a bit of spice from the Bourbon. There is a definite touch of Sherry. All in all, aging the Ford’s Gin in the Sherry/Manhattan/Bourbon Barrel was one of our best outcomes. Definitely worthy of a repeat! I wanted to enhance all of the flavors of the aged Gin and you’ll notice that this goes very light on the sweet vermouth. With so little sweetener, the bitterness of the charred oak comes through. The overall nose is Gin with a touch of oak. Flavors are London Dry Gin with a flattening of the herbal notes and a bittersweet background of Sherry/Charred Oak. The barrels previous Manhattan occupants add some dried fruit, herbs and spice. I tried this with and without expressing a lemon peel, but couldn’t decide which I liked better. So, I’ll leave the garnish to you! I though I’d take this opportunity to discuss my favorite toy, er, tool. The ice sphere maker. Bottom line, a lot of trouble for little reward. 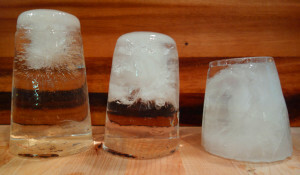 You can easily make clear ice in small quantities. But for entertaining, it’s not practical. I know that in San Antonio, we can purchase large, clear ice cubes for as little as 35₵ each. Nevertheless, if you want something for a small, intimate occasion, here’s a fairly simple method. 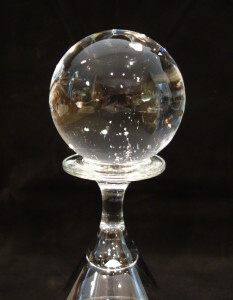 Other than a few bubbles in the bottom, this is a clear ice sphere. To avoid the first two, use filtered water. We use tap water run through a reverse osmosis filter. The last two are harder. To control bubble formation and fractures, you need to control the speed, direction and time of freezing. This cube was frozen in the center of a 6 cube tray. It froze from the side (left), top and bottom. You can see that the fractures and bubbles formed where the ice began to meet. Bubbles form because air is forced out of solution when the water forms ice crystals. As the water freezes, air will come out of solution and become trapped in the ice. The more slowly the water is forming ice crystals, the less likely air will become trapped in the ice. So for bubbles, speed of freezing is the key. As long as there is free water next to the freezing water, the air will move into the free water and away from the ice crystals. Compression fractures are caused by ice expanding as it freezes. If the water is freezing from one direction, it will remain clear. 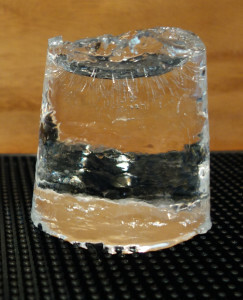 When the freezing ice meets the bottom of the container, or ice freezing from another direction, it will fracture. These 3 pieces of ice are sitting top down. All used filtered water. Left: there was a small amount of unfrozen water in the bottom. Fractures and bubbles had started to form. There is plenty of usable clear ice in this piece. Center: the ice has frozen to the bottom. Fractures take up half of the ice. Right: this piece froze from all directions and is heavily fractured. To freeze from one direction, put the water in an insulated container without a lid into your freezer. The closer the temperature of your freezer is to 32⁰F (0⁰C), the slower your ice will freeze. And the faster your food will spoil. Since we also like to eat, and I don’t feel like having a dedicated freezer to make clear ice, I just pressed on at -6⁰F. Here is how I solved the insulated container. 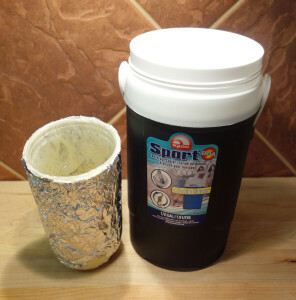 On the internet, you can find instructions for using spray foam insulation on a cup to make a cup sized piece of clear ice. The problem I have with this is that the foam insulation is not food safe and gives off noxious fumes. So, I limited its use. Instead, I purchased an Igloo ½ Gal. cooler with a screw on lid and some Hefty disposable clear 24 oz. cups. The disposable cup did not quite fit snugly into the bottom of the cooler. This meant that cold air would surround the cup allowing the ice to freeze from multiple directions. Here you can see through the plastic that the foam is now near the top of the cup. To prevent this, I lined the bottom of the cooler with aluminum foil, (plastic wrap would be better, but I couldn’t get it to stay down in the bottom). I then put about 3 inches of spray foam insulation into the bottom of the foil lined cooler and shoved 1 Hefty cup down into the foam. Looking through the clear plastic, I could see gaps in the foam near the top of the cup. I carefully removed the foil, foam and cup and gently squirted additional foam between the foil and the plastic. I then put it all back into the cooler. This was allowed to dry for 24 hours. 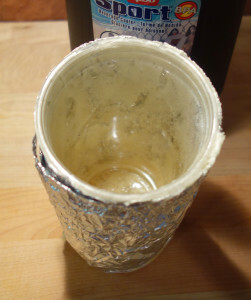 I again pulled out the foil, cup and insulation and trimmed the excess foil and insulation from the top of the cup. The plastic cup now fit snugly into the cooler and my contraption was ready for use. 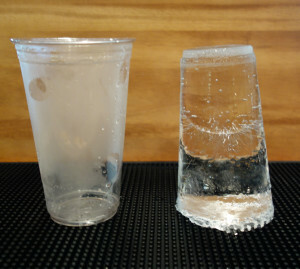 A clear ice plug next to its Hefty cup. It is sitting top down. You can see the freeze line in the center. The bottom and lower sides of the cup had begun to freeze. Since I refuse to raise the temperature of our freezer, I found that the ice still froze to the bottom of the container too quickly. It was not frozen enough overnight, but was frozen to the bottom before I got home from work. My solution was to first pour very hot water into the cooler and let it sit for 5 minutes. I then drained and dried the cooler and pushed my cup/foil/insulation assembly into the bottom. Next, a single clean Hefty cup was filled with filtered water and set down into the cup/foil/insulation assembly in the bottom of the warm cooler. To remove the partially frozen bottom, hold the ice with a towel and tap it with a heavy knife. This set up froze the water nearly to the bottom in 22 hours. I broke the bottom of the ice to remove a small amount of water, and then saved the ice in the freezer in a plastic bag. 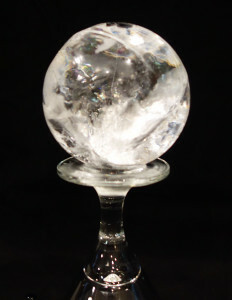 This ice “plug” can be used to make an ice sphere or a large ice cube. 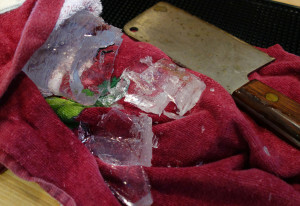 Of course, as you can see in the above video, the ice plug can shatter even if you allow it to temper before shaping. Clear ice plug ready to shape. Always allow the ice to ‘temper’ – let the surface warm to room temperature. The ice will then appear clear rather than frosty. Otherwise, it is more likely to fracture when you shape it. 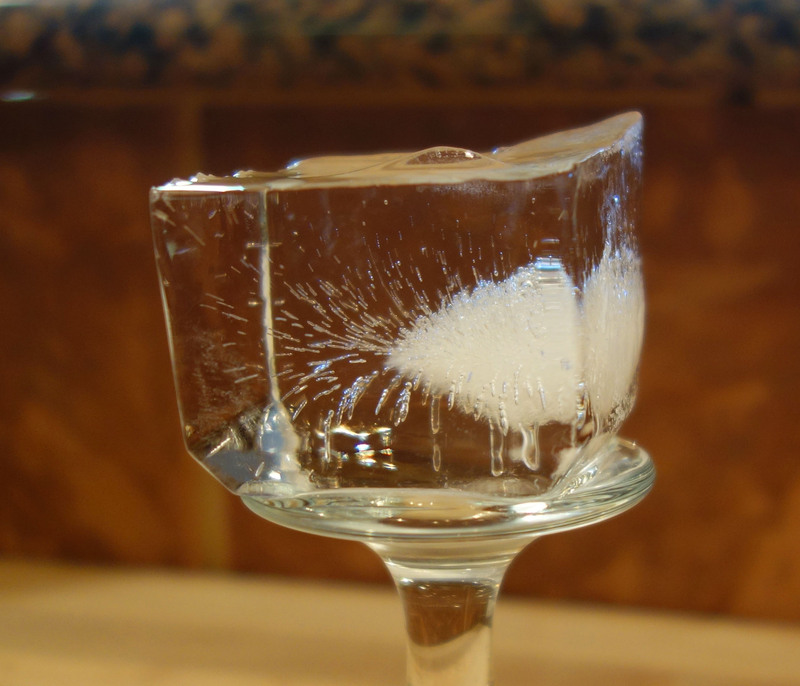 Clear ice sphere that shattered in the ice sphere maker, even though it was tempered. These fracture lines are on the surface and disappear quickly in the drink.